Earnings season's in full swing, and we're seeing some initial indications of sector rotation. Some big tech names (e.g. Facebook, Twitter) sliced through their moving averages on the way to ~20% declines in a single trading session! As always, follow your process, and let it tell you whether this is a buy-the-dip opportunity or something else. The S&P and Dow start the week above their 20 and 50 day moving averages. The Nasdaq starts just below the 20 day, and above the 50 day. And the Russell 2000 starts below both the 20 and 50 day. The moving average signal starts the week at mixed. 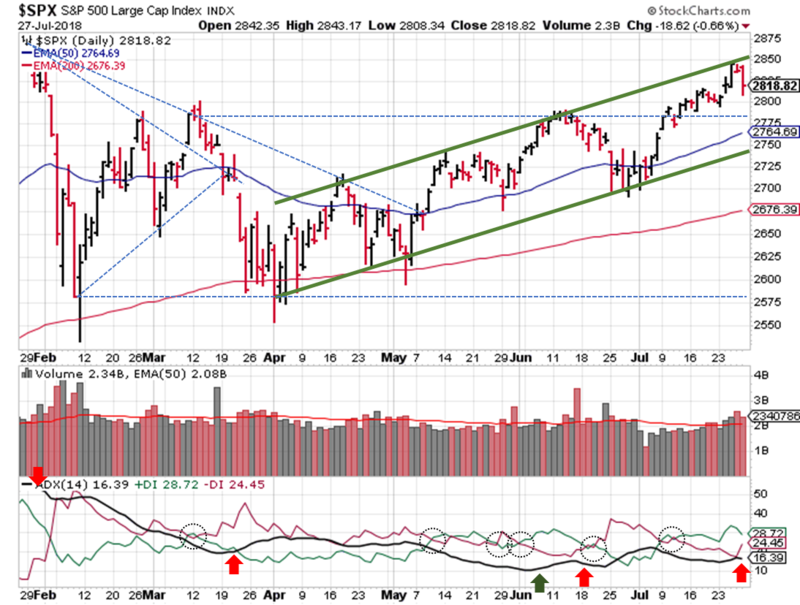 Most of the major indexes picked up a distribution day last week, but the signal remains in an uptrend. The OEW uptrend signal also remains in place. The S&P target is ~5% above current prices, and then it's time to start charting the next major downtrend. OEW estimates prices could drop 20%-30%, but if you follow a process and good trading money management, you should be good to go. If you've been charting the price channel from earlier this year, you probably noticed that the S&P ($SPX) touched the upper trendline last Wednesday and weren't surprised when the market sold off on Thursday and Friday. As for the ADX, the advance to the upper channel wasn't strong enough to put the indicator above 20(!). Friday's price decline generated a potential sell signal, as the ADX line turned downward and the DI- spiked. 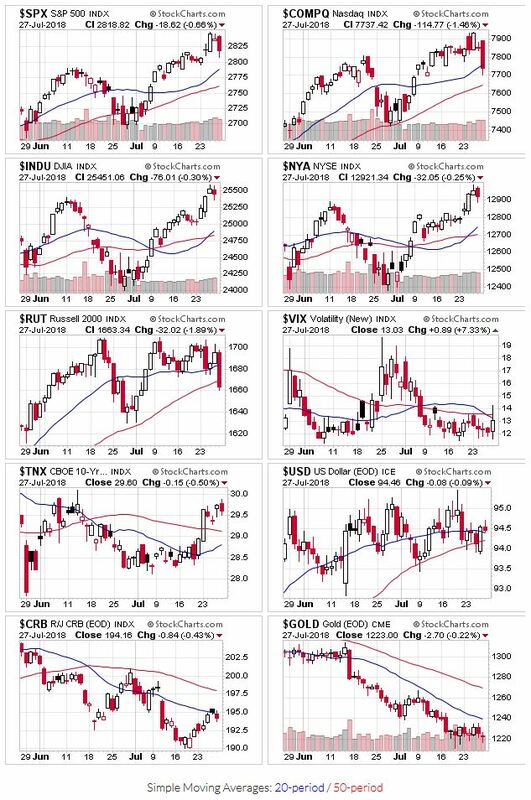 Either way, the trend remains very weak.